A stage with a finishing circuit including two times over the tricky Cresta del Gallo climb, a narrow climb that’s chased by a steep and twisting descent. Stage 7 Wrap: a thrilling finish after a long day. A breakaway built up a big lead and it seemed like they were away for the day but the bunch led by Movistar cut the gap down to reverse the situation only for the break to hold on. It came down to three riders with Jerôme Cousin (Europcar), Ilia Koshevoy (Lampre-Merida) and Bert-Jan Lindeman (Lotto-Jumbo) and all three looked stuffed in the final kilometres as they traded attacks like punchdrunk boxers. Koshevoy was the most active but the most generous while Cousin, once a track racer, had a wily sprint but overlapped his front wheel with the Lampre rider and took a tumble leaving Lindeman to win with a powerful sprint to the line, a victory for stubborn force or intelligent pacing? Or both? Lindeman was unemployed when the Vacansoleil team folded but he found a ride with the Rabo development team and used that to get back to the pro peloton earning the first Dutch stage win in a grand tour since Lars Boom in the 2014 Tour de France. Behind the main contenders left it late to show themselves. Fabio Aru was the best and his move looked rampant but he only put five seconds into his rivals. Chris Froome, Dani Moreno, Tejay van Garderen were among the main losers. Game over? No but if they can lose 30 seconds on one climb where things went wild only in the final moments then their rivals have an interest in burying them in the coming days to ensure they have no third week revival in the mountains and time trial. The Route: the Cresta del Gallo is the obvious strategic point, it’s climbed twice with 36km and 17km to go. It’s 4.2km at 7.5% which makes it a hard, selective climb and more so because of its irregular nature and rough road surface, this is what we might call a tertiary road. There’s a 10% section midway to make it every man for themselves and the descent isn’t easy either, in 2009 Linus Gerdeman led over the top but crashed on the way down, Simon Gerrans won the day. The Finish: the race runs into Murcia for an urban finish. It’s fast and flat with wide roads. After the one kilometre to go banner the route crosses the Rio Segura and then takes a big avenue all the way to the line. The Contenders: it’d be great to imagine a scrap between the top riders on the climb and then a sprint between them in town. But given how cagey they are right now – see yesterday’s climb where the moves only happened late – it’s hard to imagine big risk taking with 20km to go. Alejandro Valverde is the local pick as he lives nearby but this is too obvious almost and the climb might not be selective enough to bring in a group of under ten riders from which he can sprint. Still with such an open stage he’s a safe pick. Some random breakaway names to think about. Adam Hansen can do well on a course like this, Blel Kadri is suited to these climbs, Stéphane Rossetto has a big and unheralded engine, if Steven Cummings has recovered from Thursday he’s a contender and Simon Gerrans could repeat his 2009 win. Giovanni Visconti has won stages like this before but is he allowed to ride away or on duty for Valverde and Quintana? If things get back together then Peter Sagan could be in the mix but the double climb is probably too much for him, the same for Julien Simon of Cofidis. Weather: hot again with temperatures of 33°C. Remember the numbers used in weather reports are shade temperatures and it’s always hotter out on the road. TV: a made for TV stage with the added climbs and finishing circuit. They climb the Cresta del Gallo for the first time around 4.40pm Euro time, the second at 5.15pm and the finish is for 5.40pm. It’s on Eurosport too and you can rely on Cyclingfans and steephill.tv for links to feeds and streams. Daily Díaz: Welcome to Murcia, Europe’s h​uerta!​ Fertile soils and warm temperatures make for a very productive agricultural area. What’s missing from the equation? Water. The rainfall is under 300 mm per year, which accounts for B climates (according to Köppen’s classification). What’s the problem with the rain in Spain? Its distribution is very irregular in time (long arid summers) and space (some of the most densely­ populated areas are some of the driest). Realising this problem, the Spanish authorities thought of taking water from some parts of Spain to others: that’s, for example, what happens with the Tagus­-Segura water transfer, active since 1979. It links the T​ajo​ river in central Spain (a very lowly populated area) with the Segura river in the Southeast (very populated, with important agricultural and touristic resources). See more over at Youtube. I honestly don’t know what game Movistar were playing yesterday (I seldom do), but the stage was good fun. Glad Cousin didn’t win, as he rode speculatively, parasitically, and not generously, although he looked the strongest. Froome doesn’t look good, but I hope he doesn’t give up. Merckx and Hinault came back from situations like this (and worse) in their GT careers, and if Froome manages to do the same, his victory will look like a jewel in his palmarès. it was indeed cagey stuff from the GC contenders yesterday, but personally I enjoy the chance it gives for others to fight each other for the stage. The climb of the Capileira yesterday was like a death march as the lead group became more and more exhausted – gripping stuff I thought. My shout would be more cagey stuff today perhaps allowing a break to win…tough to pick a winner. While froome was far from his best I was more surprised that the other GC rivals didn’t take more out of him. Froome did his trademark ride at his own pace to limit his losses. Given this has been his target Aru looked far from convincing, maybe I’m not giving credit where it’s due but it seemed like a big effort for little gain. At the moment no one looks particularly strong and I can definitely see this going to the last week as those coming from the tour ride in to form. Aru always looks like he’s putting in a huge effort. Nice to see a geographical slant to the local information!! Murcia and its region, with adjoining Almeria, are well worth a visit. We take student field trips down there each year – keep an eye out in the supermarkets for salad and fruit produce from Murcia and Almeria, especially during the winter. here in central Europe, spanish fruits dont really have a good Reputation. Many of my friends avoid them, not because of Quality, but working conditions. Agree about those working conditions. We see a lot of trucks from Murcia and Almeria here heading to packing plants in the Fens of the UK where I live. Some of the road signs close by are in Spanish reminding them to drive on the left! I believe some of the large salad producers her own land down there? Appreciate the attitude, still it’s worth remembering that working conditions became even worse thanks to the new job laws that have been required/imposed by *Europe* – a word which nowadays means just a couple of countries (maybe one). I’m sure that the present Spanish government and the corporations/owners (be they Spanish or, as it often is the case, be they from other countries… where working conditions are better) were more than willing executioners, but Europe’s role was decisive to force things against the shared social views of the population. Actually they are neither orange nor figs but olive trees. Are we also in / near Spaghetti Western country today ? I was very disappointed that no-one commented on my Angel Eyes name change suggestion on the other day, ha ! youre right, there must be a Little mock-up wild-west City near Almeria where they shot “for a few Dollars more” –> https://en.wikipedia.org/wiki/Mini_Hollywood !!! great stuff vuelta should make use of it! Very conservative rides for the GC contenders yesterday. We miss a Kontador to spice things up… Seriously speaking, it was surely a great opportunity to make time on Froome for the likes of Aru (or Purito). In last year’s Vuelta, Purito and Valverde had some opportunity to put Froome at a good distance in the 2nd week, but they did not do it. 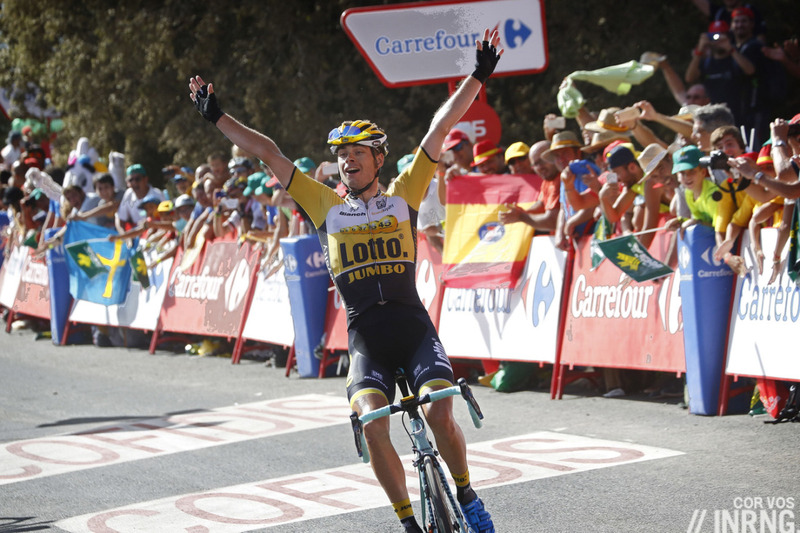 At the end of the Vuelta they finished 3rd and 4th as Froome got better in the 3rd week. One must say as well that yesterday’s climb lacked steep parts, it was just long. Not the best for attacking. In any case, I don’t know whether Froome will get better in the coming days, but this kind of climb is very suited to him, so to see him dropped is no good signal. I forgot: thanks for the valuable information in the daily diaz. I understand that this year is particularly dry and that there is some polemics between Murcia and Castilla-la-mancha governments (where the Tagus river mostly flows) for the water transfer. Luis-Leon Sanchez is from the area as well, is’nt he ? Astonishingly, he’s never won a stage of la Vuelta so he’ll be super motivated. Either from a breakaway, with a move at the top of the climb, or ‘en finisseur’ with 1 or 2 k to go, he’s got the tactical nous and certainly the legs as well. Interesting to see Froome being dropped. Sky are clearly having second thoughts on this as there train hasn’t been working much at the front on these climbs. I think he’s sandbagging, to make himself seem more mortal. @anonymous: Unlikely – if he was doing that he would have hung around yesterday to draw as much attention to his performance (or lack of it) as possible. Instead he immediately turned back around and went down the hill to the team car. Even Roche said he was grumpy with his performance. Froome’s lieutenants look tired. Thomas especially has not been able to shelter him in the latter part of stages, while Roche lacks his usual punch. Henao has been quite disappointing. Thomas said at the very start of the race that he’d be likely working early on, and to not expect to see him up with Froome at the end of climbs. He’s had next to no race days between here and the Tour, had his stag in between, and it was a late decision for him to race. His goal is the World’s and he’s here to race himself into form & race fitness for that. Very true, except maybe the fact that particularly yesterday he hadn’t been working early on (just as his whole team wasn’t). He even tried to show himself up on the front during Movistar’s forcing in the first part of the climb, but didn’t succeed. We may expect it him to find some fine form through the second and third week to be ready for the Worlds (some good occasions for stage-hunters). Froome repeating 2014 Vuelta? Remember, he faltered last year too but by week 3 only Contador was stronger. I would advise his opponents to strike whilst the iron is hot… and before Froome finds himself again. 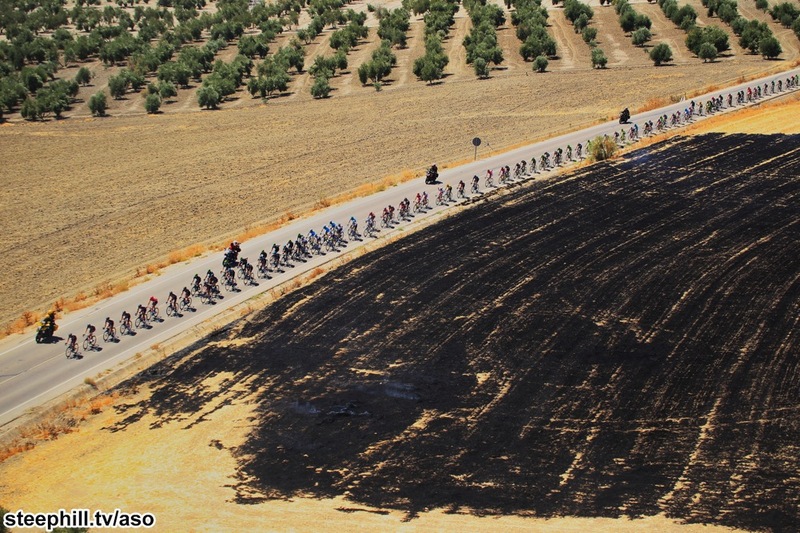 I see this Vuelta being all about stage 11 really though. No one will win this race who does badly in Andorra next Wednesday. The more appropriate reference should be the 2012 Vuelta. In 2014 he barely made any significant effort during the Tour. He entered the Vuelta with some 31 days of racing, that is, more or less the standard calendar of top contenders… towards the Tour. I’m not saying that it is fine to have that few racing days, especially if it’s due to a weak and troubles-plagued season as it was for Froome in 2014: but what’s for sure is that you’re, at least, quite fresh, way fresher than most of your rivals (Contador had 43 racing days, 54 for Valverde, 56 for Purito, 41 for Aru). You could sense the weight of racing days in Valverde and Rodríguez’s last week. This year Froome’s got some 49 racing days and a wholly battled Tour on his shoulders. He should be even a bit more fatigued than in 2012, when he had raced some 43 days and he was quite at ease in the Tour’s harder stages, given that he had to shepherd Wiggins through the (few) mountains. Though, he was clearly fading away in the Vuelta’s conclusive week after a good while not brilliant first half of the race. Some kind of turn was marked by the 40 kms Pontevedra ITT, on stage eleven, where he was losing ground to Contador and taking less than 1″/km on Valverde and Purito. There was a 500m-altitude-gain climb, still it isn’t a good performance for the usual Froome. In 2013 he approached the finale of the season with some 52 days of racing. He was absolutely disappointing and under-par all the way down to the Worlds, raising doubts and perplexity among long-time fans who couldn’t properly understand *what was he doing*. This isn’t a good term of comparison, though, since – well – he just didn’t ride “the Vuelta” and probably and a mental shutdown, being forced to race by other kinds of reasons. 2011 isn’t a good example, either, because he entered the Vuelta with an impressive number of racing days, indeed, some 60 or more, but they came from lesser races (Brixia Tour, Tour de Luxembourg, Vuelta a Murcia…). Besides just a couple of *top 20* placings (14th in Castilla y León, 15th in Romandie), he *always* struggled to make the *top 50* GC in all these minor races. Also note that he never was “on service” for Wiggins in any of them. That year is one of the greatest mysteries of cycling histories, I suppose. Any gregario with some GC attitude doesn’t struggle that much to make a better GC in minor stage races. It comes out as a natural result, you don’t need to put in specific efforts or to renounce to your due programmed training. Then, a sudden autumn blossoming. The bilarzhiosi thing, we must suppose. However, nothing useful to set any kind of historical reference. Let’s finish with the supposed rivals’ racing days this year before the Vuelta started: 62 for Valverde, 55 for Purito, 43 for Aru, 48 for Chaves (his Giro wasn’t Aru’s, anyway), 55 for D. Martin, 57 for Quintana, 42 for Pozzovivo, 64 for Majka. Which means that in terms of absolute performance it would be pretty strange that Froome had a 2014-style Vuelta, even if we admit that he matured and became a better rider when compared to 2012 or 2013. All the same, the fact that most main rivals should be quite fatigue-loaded, too, gives him some chance in terms of relative performances, albeit a great progression of form can’t be expected (or would be a little suspicious, let’s say so). PS Purito and Valverde entered the 2012 Vuelta with more or less the same racing days than this year (a couple of days less for both of them). Contador had just 14 racing days because of the sanction. The high GC men were all quite race-days-loaded, Gesink, Moreno, Talansky… maybe with different levels of effort. However, it doesn’t look like that 2012 panorama was that different from this year’s – Contador apart. “I have no idea what the hell you are talking about”. There’s no performance formula and surprise results are always possible, but generally speaking similar conditions should produce similar results. Identical conditions won’t ever be there, hence it’s nowhere near deterministic, but to make a comparison you should take into account similar factors. Year-long fatigue is a big factor in cycling. Riders are different, for example Valverde can perform with more fatigue than other riders as he proved through his whole career. That’s why I focused the analysis on Froome’s effort through the season and his subsequent results. Then you can observe that it wouldn’t make sense that Froome performances followed the pattern of 2014, as you say (you were the one trying to find previous references… if your rule is “performance vary”, no point in your exercise). That is, unless some big difference in his prep has been introduced this year for the first time. I’d say it would hardly be possible that his Vuelta followed the 2014 scheme. His present season is pretty similar to 2012 or 2013, so what we can expect is a comparable evolution, in broad terms. To be “proved right” you should offer a reasonable explanation for your prediction. On the contrary, it’s just wild guessing, and since cycling is indeed quite unpredictable you’ll always have a however little possibility to get your guess “proven”. Probably someone had put his money on Cobo when the 2011 Vuelta started, feeling the guy could sometime express his full potential of GT rider… know what? They’ve been proven right – or they’ve just been lucky to meet their prediction with some *unknown known* [cit.] element of the setting. Aru did well to work hard for “little gain”. 30+ seconds on Froome in one stage is valuable. Has to considering the final week time trial. It’s still early. How much time does Aru need over Froome before the time trial? Aru may not have gained a lot of time, but for me the good sign was that Astana seems to have found their mojo as a team with a leader. Besides the fact that I like Aru as a rider, this should spice things up versus SKY and Movistar. Yesterday I felt fortunate to find a pirate feed that played the Eurosport British (not so fortunate that the commentator is that guy who prattles on worse than David Duffield at times) race coverage from 30 kms out without interruption or a constant barrage of pop up advertising. Today might be a different story? Forza Aru! Been there, done that. Never again. Operations like these in the past continued to charge our credit card months after we stopped their service! Only contacting the fraud department of the credit card company put an end to the charges. Sling might be run by wonderful, honest, ethical human beings, but the clowns who came before them with this scheme burned me too many times. Races (for the most part) are held on public roads and the public can watch for free – why should TV broadcasts of the events be any different? Not my experience Larry, you just have to turn the sound off ( Pandering US clowns ) worse then any European announcers by far. BTW great picture quality to boot!